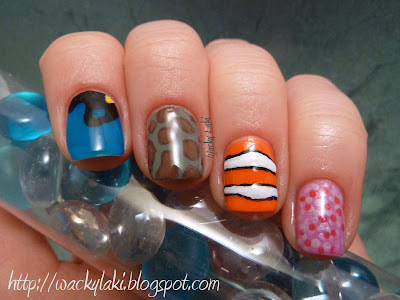 The movie I chose for the challenge inspiration is the cute animated film called Nemo. I'm sure most people have at least heard of it, if not seen it. 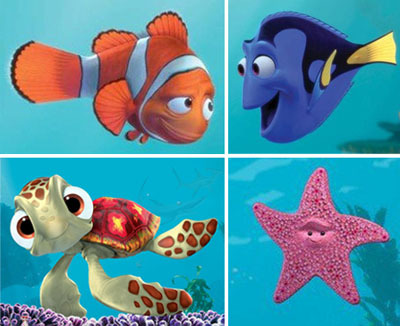 It is about the adventure of a fish named Nemo as he tries to find his way home. I thought the colorful characters would make for a great manicure. Here are the characters that inspired this mani if you have not seen them before... Nemo and Dory in the top row, Squirt and Peach in the bottom row. What do you think about this mani? Do you wear manis with each nail done differently? Personally I think it would be fun to recreate each of these as a full mani... would you like to see any of them as a full manicure? Such a cute I idea, I love it. That is so adorable! Great mani! 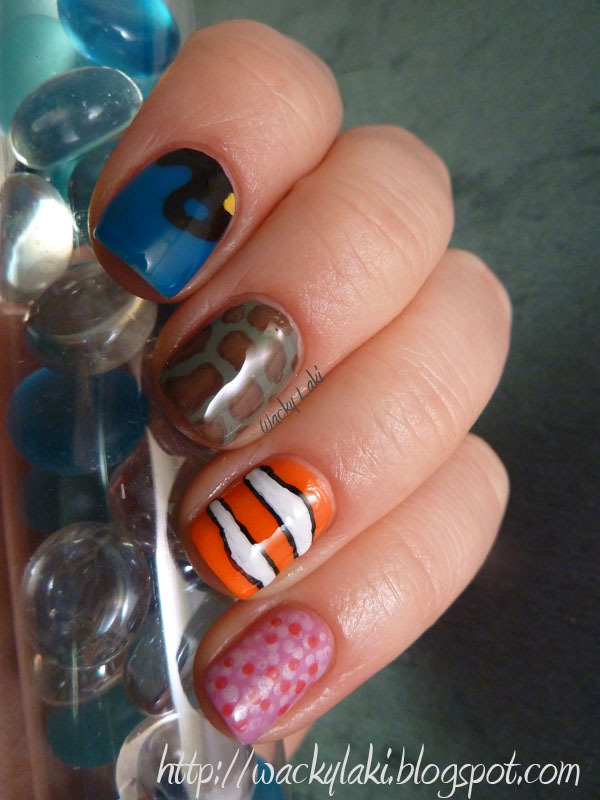 I could totally guess what movie you were doing from your nails! I REALLY like how you didn't just draw the fish but focused on its colours and patterns... I loved Dori in this movie "just keep swimming just keep swimming". @Megan, I love that little squid too. They have some adorable characters in that movie. Oh, this is really cool. And what's cool is that I saw the movie straight away without reading! I know I'm super late, but I LOVE this!! So cute! !